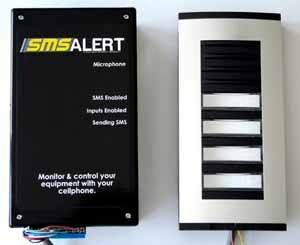 - Electronic SMS equipment, called SMS Alert, for alarm systems and other monitoring and control purposes. - Development of ad-hoc products. 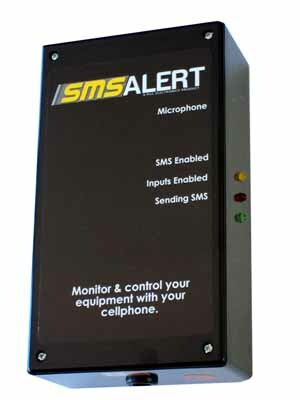 - 500 plus customized SMS Alert product solutions have been produced - only the core models are listed. - Supply of selected electronic equipment/parts. For orders, quotes, product info & user manuals email Hester Lombard: info@smsalert.co.za. Click here to download our Distributor/Trade Application form if you have a shop and want to become a distributor. All prices ex VAT unless otherwise stated. 9 inputs (8 AC-Opto isolated inputs, negative or positive trip selectable). 3 x 10A relay outputs ( additional 3 optional). Re-nameable SMS text input strings. Overall status request at any time. Missed call to and from option. Airtime can be loaded and checked on system. Specific software available, e.g. Roboguard and triple partition. Voice Alert (Audio) optional available e.g. "Power ON". 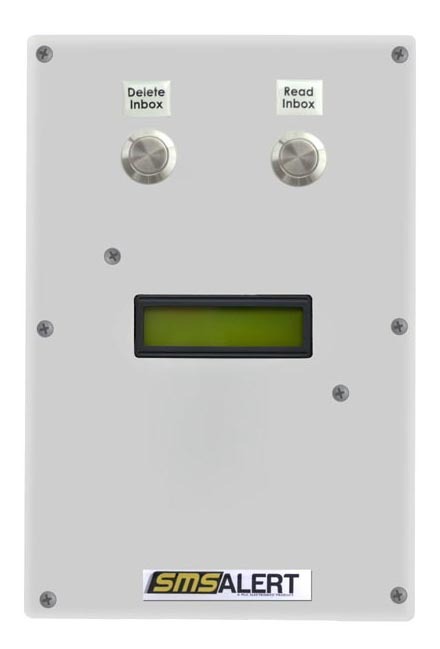 3 inputs, 1 x 10A output (1 = burglary, 2 = arm/disarm, 3 = panic). Recognizes up to 16 missed calls or unlimited missed calls, e.g. to be used as a gate opener. Used as a basic alarm module. 6 to 8 zones (AC-Opto isolated) and panic. Siren output, 1 minute timeout. Voice Alert (Audio) optional available e.g. "Zone 1 activated". 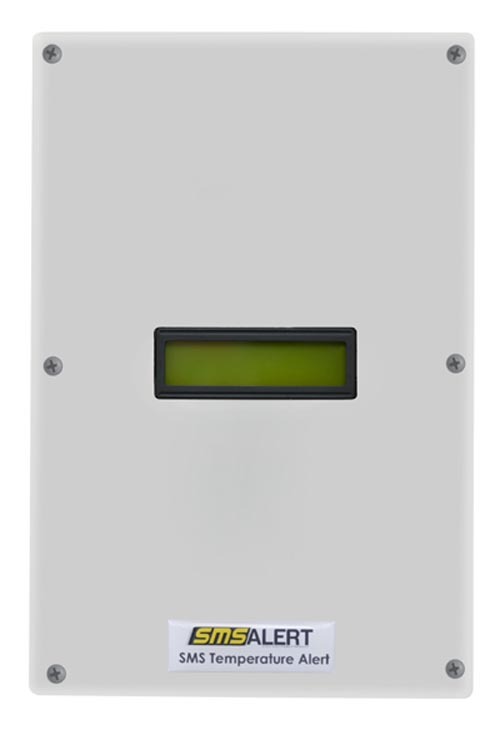 Ideal to provide SMS notifications for fridges/freezers/computer/server/air-conditioned rooms. Reports to 8 cellphone users when temperature goes above or below the range you are monitoring. LCD screen on which you can check the temperature. Also monitors power loss/restore (Eskom power). It notifies you via SMS when the power is off/on. Temperature range is adjustable by the user (you programme it yourself). Plugs into wall with a three-point plug & operate – no installation needed. It has a 1m wire (6-core) with a temperature probe at the edge that you put inside the fridge, under though the rubber of the door (the whole system is not put inside the fridge/freezer). It has a 1 Amp battery inside, which will give you a battery back-up time of 2-hours. A water sensor can be added to notify you when the water levels in a tank are above or below a certain level, or to notify you when water is flowing into a room. - A custom SMS Temperature Alert can be made up to monitor up to 10 fridges if you connect extra sensors of R750 each. Each extra sensor can be up to 20m away from the main SMS Temperature Alert, on the same premises. The older systems that doesn’t show the temperature in the SMS’s can monitor 12 fridges. - Pharmacy / Doctor refrigerators. Optional use in conjunction with SMS Temperature Alert above to log temperatures. DIY - Portable alarm system with pepper gas. Plugs into wall socket & operate – no installation needed. Includes pepper gas, one PIR motion detector, sound bomb siren, 1.2A battery & 2-button remote (for arm/disarm & panic). Power Loss & Restore SMS notification. System can be checked, armed and disarmed via SMS. Listen-in microphone to verify adjacent noises. It also includes: Additional 5 zones split into 2 partitions for expansion at a later stage. The 2nd partition can be bypassed. An additional relay output can be used e.g. to open/close a gate or switch a light on and off. Airtime balance can be checked on the internet or via SMS. Other functions: Walk-through test function & auto battery disconnect when battery is low. Solar panel connector with regulator. Regulator already built-in. Unit can be used in your house, caravan, gun safe, freight containers, etc. Use as a back-up alarm should intruders bypass your existing alarm. The pepper gas sprays 5 pulses at a time when it is set on automatic. It sprays 1 to 10 pulses when set on manual, depending on which message you SMS it. It can spray 20 pulses before the can is empty. The pepper gas will either spray together with the master unit, or each slave unit can spray on its own. Wireless indoor PIR's and/or Outdoor Roboguard PIR's. Products can be customized e.g. with battery clamps and low battery notification for use where there is no electricity. Plug into wall & operate, no installation needed. It consists of one box, with a 1m cord and a 3-point plug at the end. Battery standby is 6-8 hours. It reports POWER LOSS and POWER RESTORE via SMS to up to 8 users when the 220VAC changes, in other words, when there is an electricity failure, and again when the electricity is restored. It will also report LOW BATTERY when the internal 12VDC battery goes flat. It has an output that you can remotely latch or pulse via SMS for ad-hoc use (please specify on order). Listen-in microphone can be added to verify adjacent noises (e.g. generator running, UPS on). Also available to monitor 110VAC or 380VAC – specify on order. 1 600 authorised users. - When these users make a missed call, the gate/door will open. 400 special restricted users. - These users can be set up to open the gate during certain times and certain days of the week. Users can also be set up to open the gate a certain number of times and then the user will expire. Operating voltage: 5 - 30 VDC. Unit is programmed via SMS. 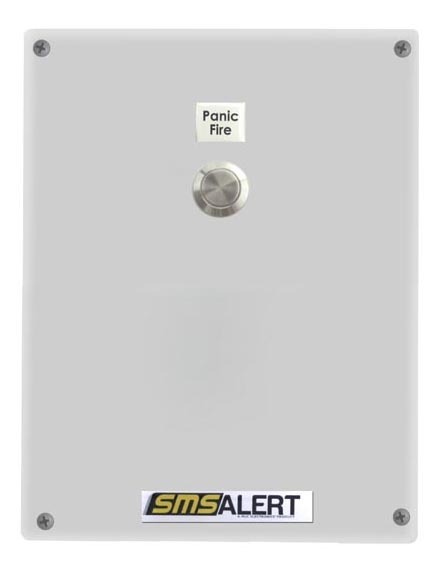 Sends panic SMS (4 seconds apart) to up to 8 people when the button on the system or the wireless remote is pressed. Includes wireless remote & receiver, battery, charger, high-gain antenna & siren output (siren optional). 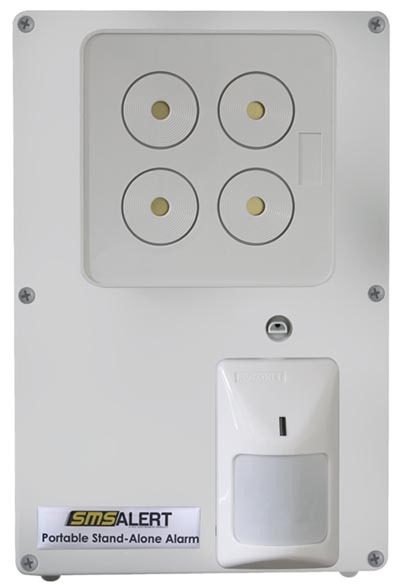 Plugs into wall & operate – no installation needed. Ideal for bathrooms/old-age homes/unsafe areas. Listen-in microphone (phone in and listen for intruders). Sends ‘low-battery’ SMS when battery is low. Power loss/restore SMS notification (future versions). Range between the wireless remote and the SMS Alert Panic system = 50m indoor, 100m outdoor. A long range receiver can be fitted to increase the range with an additional 100m. Has a siren output. If connected, the siren will go off for 1 min when the panic button is pressed. (Siren is an optional extra). 40 remotes can be programmed onto the system. Displays received SMS messages on a LCD screen, which are sent by remote SMS Alert unit(s), e.g. Panic Alarms, Fire Alarms, Burglar Alarms etc. This is an alternative to the Sherif software below. When a new SMS is received, a buzzer will sound until any button is pressed. Displays the contents of the inbox e.g. Address book name, cell number and SMS text (up to 20 characters). Address book name, cell number and SMS text (up to 20 characters) and deletes the item from the inbox. The system has 2 buttons. The first button must be pressed every 30 minutes (by, for example, the guard), otherwise an SMS will be send to someone. 30 Seconds before the 30 minutes ends, a buzzer will go off to remind the guard to press the button. If the second button is pressed, a 'Panic / Fire' SMS will be send. The system has a built-in LCD, battery and power supply. It needs 220AC and a SIM-card to function. It can be mounted to a wall. There is a key-switch at the side of the box, for activating and de-activating the system. Has an auxiliary input for an external alarm, etc. It reports to 2 users. A system with up to 14 wireless remote points available. Points must be pressed in sequence by guard. This will reset the guard monitor when all 14 have been pressed. 15 inputs, single or dual inputs. Inputs are rename-able. A software application and programmer is required. Technician mode can be purchased. Status request at any time. 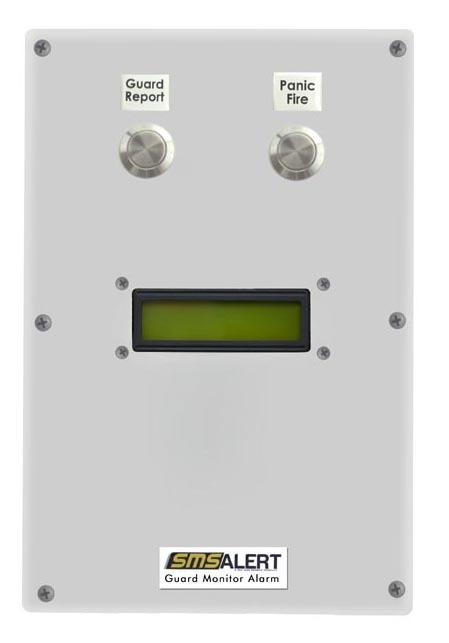 Also available as a 15 zone alarm system (SMS Alert 15 Alarm Plus). 15 inputs, reports to 8 users. Additional Power Loss/Restore, Panic, Key and Battery Low inputs. Zones can be switched on and off via SMS, or changed from NC to NO. Silent mode operation without siren activation. The first 4 users receive all the SMS’e, and the last 4 users only receive Panic SMS’e. No walk-through or test mode available as per SA9 Alarm Plus. DTMF functionality (press 58 on cellphone to open gate). 6 buttons on gate station (6 users can be called). 3 Additional devices can be monitored (inputs). 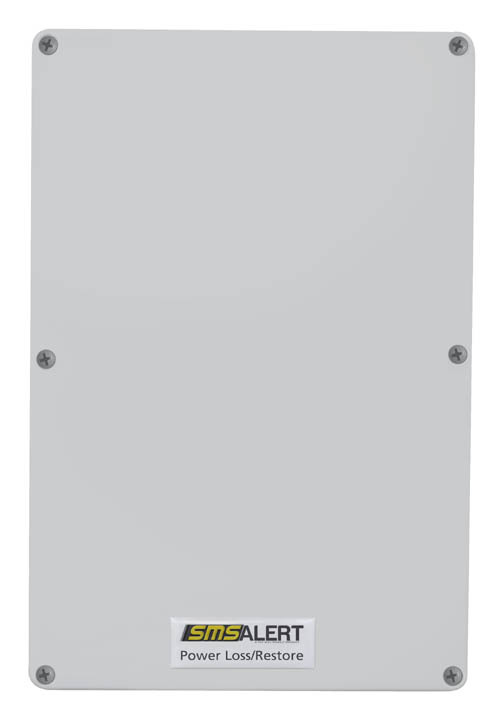 2 Additional devices can remotely be switched on/off (outputs) excluding 1 relay that is used to open the gate. Any of the 6 users who call the intercom will be able to open the gate by pressing 58 on their cellphones or unlimited users per SMS. 6 users can be called and receive an SMS when activity occurs. Airtime can be checked via SMS. 12 VDC power supply not included. 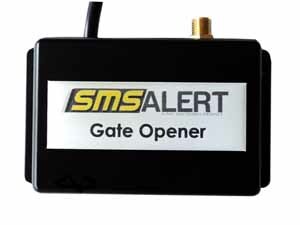 Unit is pre-wired with a 3m wire between the SMS Alert and the gate station. This distance can be extended up to 10m. Uses a GSM terminal modem or SMS internet gateway. - not responding on a daily/weekly/monthly basis. It is recommend that a prepaid SIM card is used, or that a process is in place to cancel or stop the SIM-card, or to limit SMS's in an emergency should a malfunction occur where many SMS's are sent and unforeseen costs are incurred. It is recommended to test your SMS Alert on a regular basis. A product of PicC Electronics must be installed by an installer trained by PicC Electronics.